A really excellent fightback against corporate and political manipulation. Also it saves on bandwidth costs and reduces the impact of advertising (malware embedded in random adverts). A really great use for an old RasPi which is inherently more secure than Intel/AMD based platforms. I have made a video about how to install pihole and show setting up dns in different router go ahead and check it out. This is how I put my old Pi B out to pasture. Plopped it right next to the router, even powering the Pi from the router’s USB port. 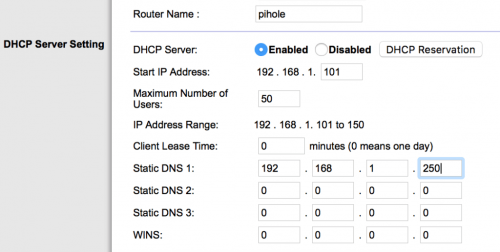 I found that the wired connection makes Pi-Hole perform even better. Not just is Pi-Hole blocking adverts, it also shows me devices on my network that are excessively trying to call the interwebs (looking at you, webcam!) and allows me to block them as much as needed. What a clever concept, will definitely be looking at this in greater depth, someone could make a lot of money selling these, Advertisers beware. 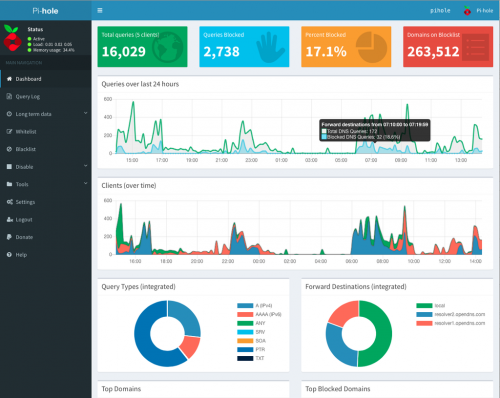 While we think our first-time setup is pretty simple, we’ve teamed up with Pi Supply to provide a pre-made working Pi-hole (along with a pretty case) for those that want an even simpler setup. It’s pretty easy to find a link to their page if that’s something that interests you, even if just to spread the word! That is good news, was not thinking of profit for myself but the benefits to other people, this is in effect mass cold calling by the big corporates, so will be spreading the word to as many people as possible via social media, Kind regards Doc Cox. Sometimes a blocklist may contain a false positive (commonly: a site that got blocked which shouldn’t have been) and in this case, adding that blocked site to your whitelist means you’ll be able to access the site again. Same goes for blacklisting – you can manually add a site to be blocked, if you don’t want it to be accessed from any device on your network. I tried Pi-hole but it’s overblocking too much. I’d spent a lot of time tuning the whitelist because some sites stopped working. Also it doesn’t respond with NXDOMAIN for blocked domains but with a localhost IP, which leads to sites loading forever.